This is a sponsored post in collaboration with Linguacious and MommyMaestra. All opinions are my own. 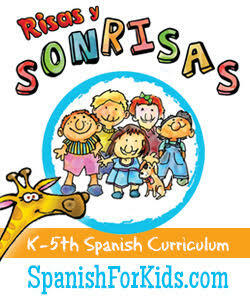 Most good Spanish learning curricula contain a lot of hands-on learning. If you flip through almost any program lesson plan and you'll see arts, crafts, music, TPR...and games. Especially games. That's because learning happens faster and easier when we are having fun. Teachers have used games like hopscotch, dominos, Uno, Go Fish, and many, many others to teach children important concepts for decades. encourage the creative and spontaneous use of language. foster participatory attitudes of the students." 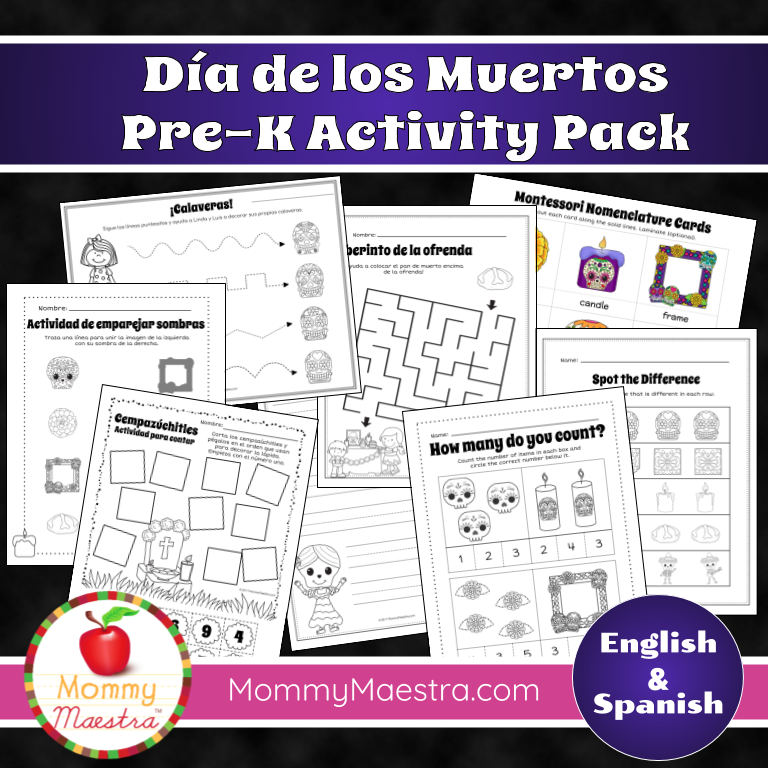 If your child is learning Spanish at home or in the classroom, there's no reason why you can't use games outside of their curriculum to supplement their language learning. That's why I love it when I learn about products independent of a curriculum that may be used to boost your child's language learning skills. So let me introduce you to Linguacious, a family-owned language learning company started by a language learning expert raising his son to be trilingual. The dad is Brazilian, the mom is Ukrainian, and their son is being raised speaking Portuguese, Russian, and English through the OPOL (One Parent One Language) approach. I was delighted to be contacted by this education company and asked to share their products. This set of game-based vocabulary flashcards is unlike any flashcard set you've ever seen before. 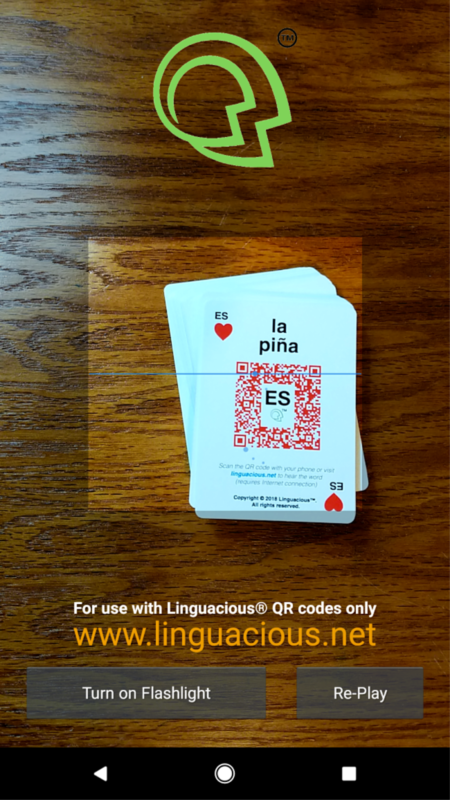 To use the cards, it is best if you download the Linguacious app. It's basically a QR code reader, but one developed by Linguacious specifically for use with Linguacious products. The result is that it scans the Linguacious QR codes much faster than other QR readers, has no ads whatsoever, and is very easy for even small kids to use; simply point at the QR code and it pronounces the word. It also has a flashlight feature, which makes it possible for kids to scan the cards even in the dark! You'll need it to work with the cards. On one side you'll find real-world images and a QR code (no written words), and on the other side, you'll see the written word and another QR code (no images). 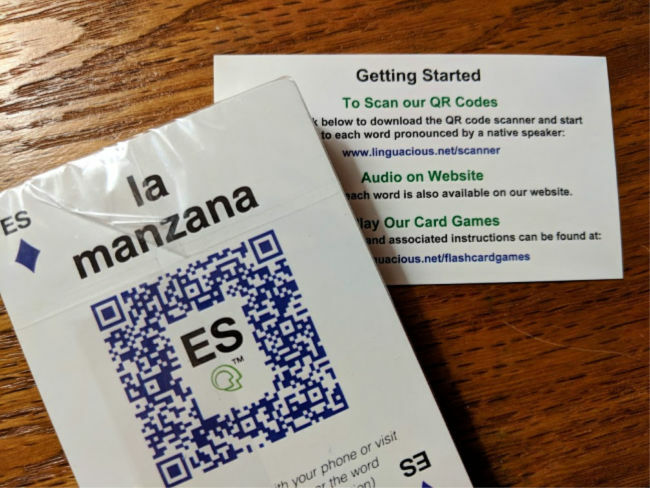 When you scan the code, you'll hear the word pronounced in the target language. It's pretty amazing because you can use each card to boost ALL FOUR language skills: reading, writing, listening, and speaking. 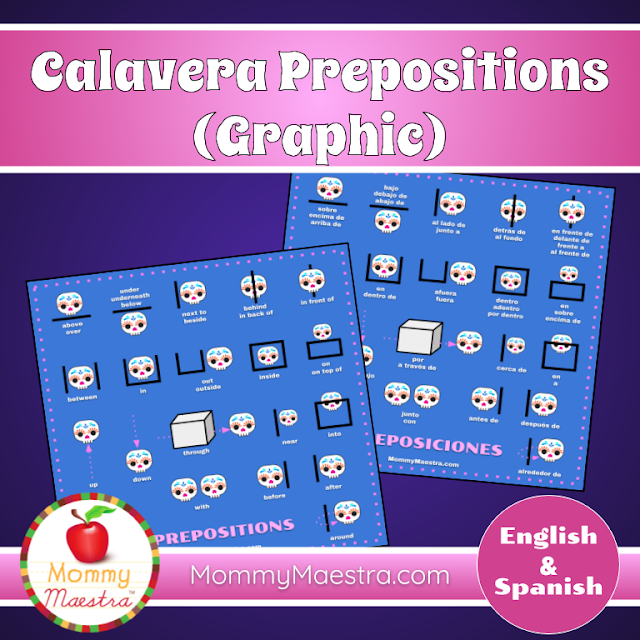 This is a precious tool for any language learner or educator. 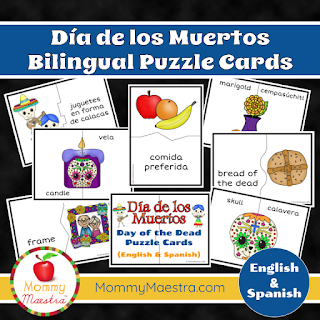 The really fantastic part is that these cards may be used with children of ANY age. 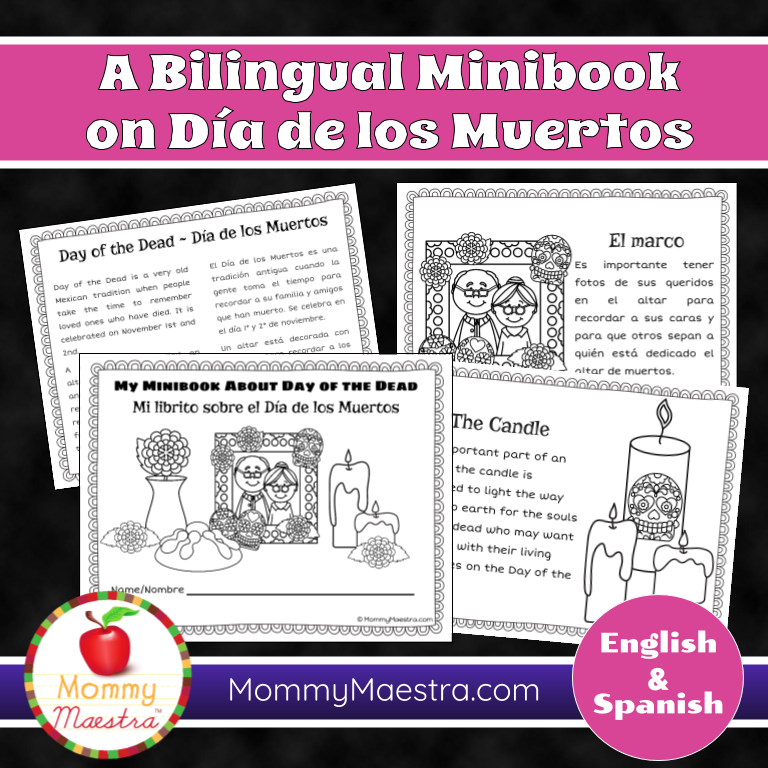 Are you working on raising a bilingual toddler? Boost his vocabulary with the Pointing Fingers game. 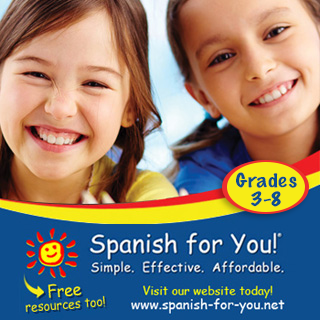 Got a middle schooler learning Spanish? Help him with his pronunciation with the Word Whiz game. 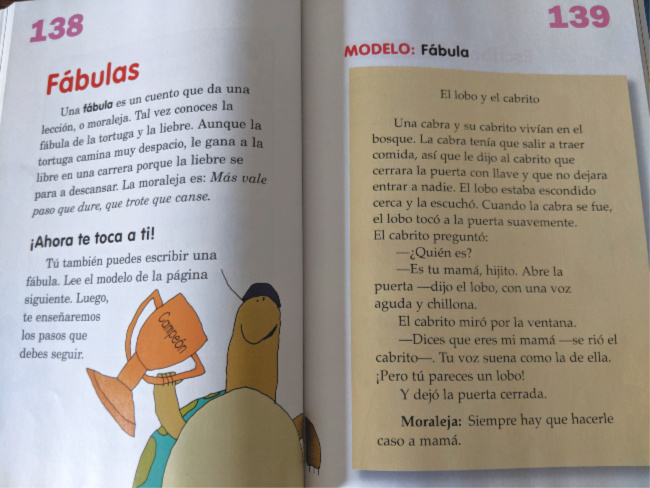 Is your high schooler taking Spanish for the first time? Help her practice her conversational Spanish by playing Vocabulary Train! Seriously, who would have guessed you could play so many games with a simple deck of flashcards? AND I was impressed to discover that all Linguacious® products come with a complimentary 2-year technical audio warranty! 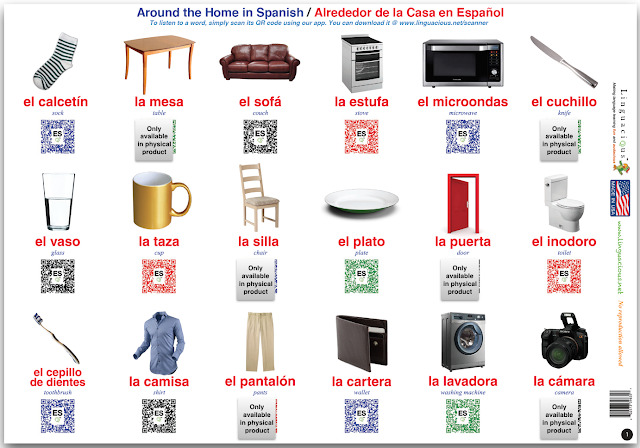 In addition to the flashcards, Linguacious also has poster sets in a similar format using the QR reader app. 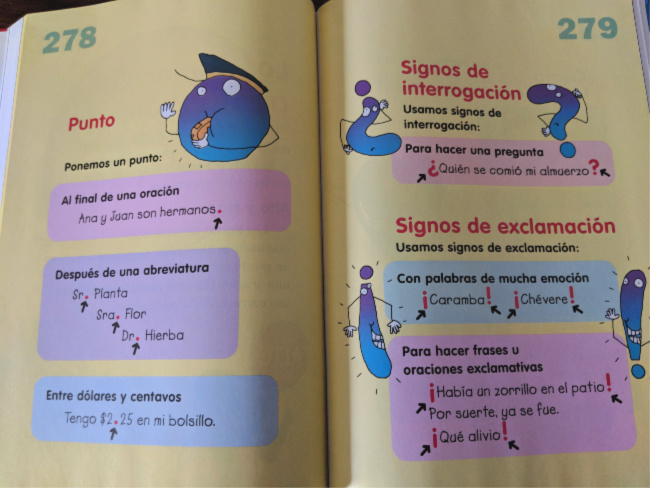 Their Spanish poster, as you can see above, follows the Gomez & Gomez dual language education model, with the Spanish words colored in red and the English translation colored in blue. 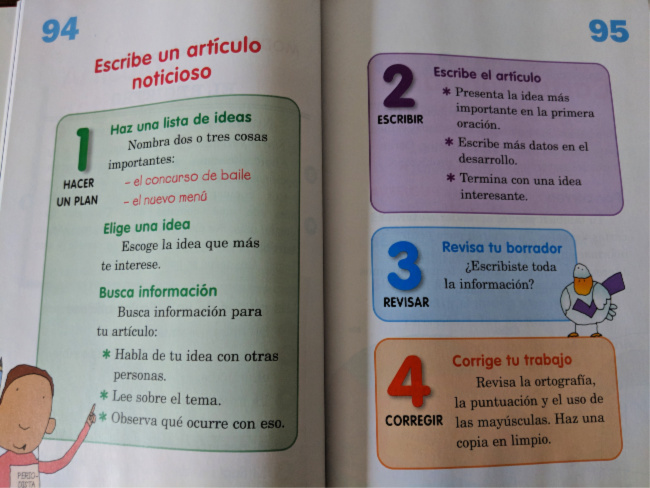 What is great is that the English translations are in a much smaller font size than the Spanish words, so that students do not use the English translation as a crutch, but only to check the meaning. The images are quite self-explanatory and clear on their own, but the small English translation may appeal to certain schools and programs. 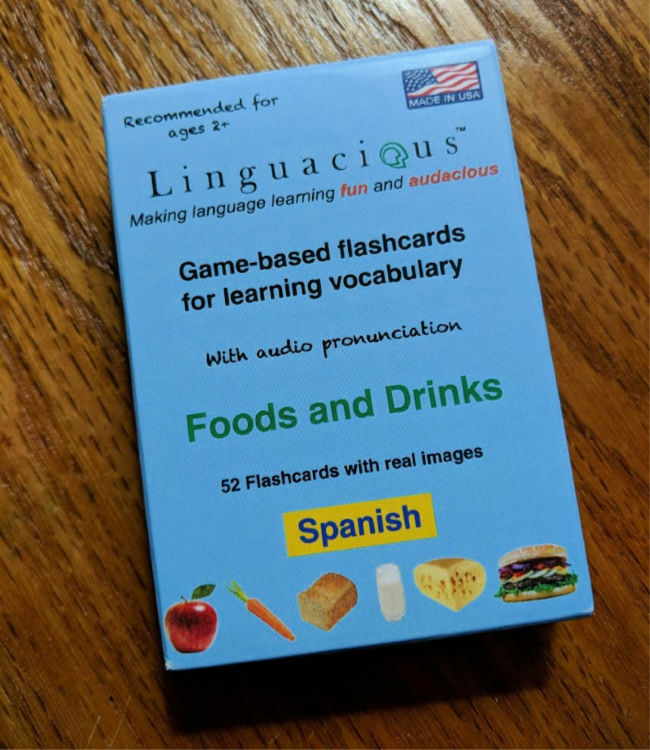 I think this would be a great addition to the Spanish-learning classroom and could be used as a language center activity while the cards could be used as a group-learning game to reinforce vocabulary. 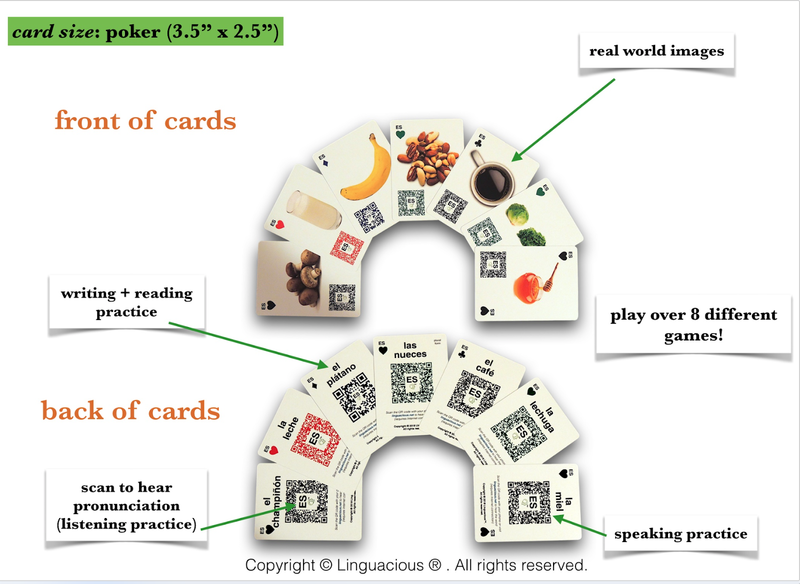 To order your own set of Linguacious cards or posters, you can visit their site or purchase directly from Amazon (aff link). 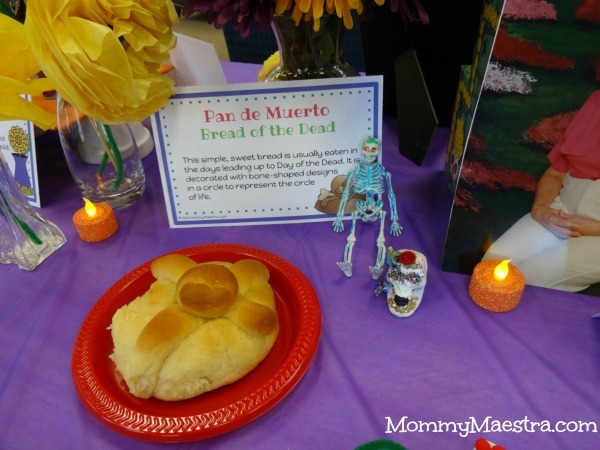 I have a fun treat for you today! 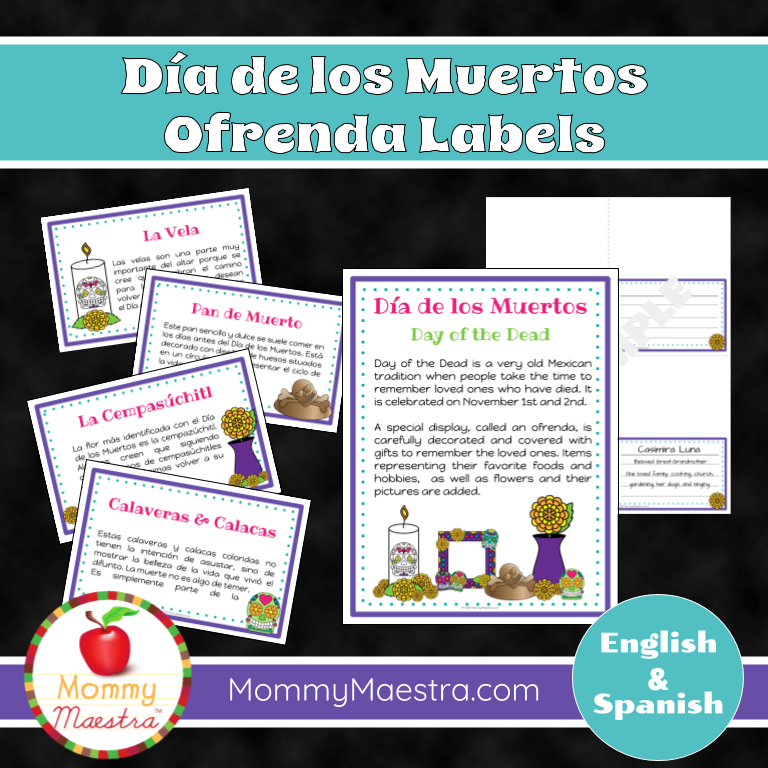 My dear friend, Melanie, from ModernMami.com recently created a document for her son's class when she went in and shared some Spanish as part of their Hispanic Heritage Month unit. 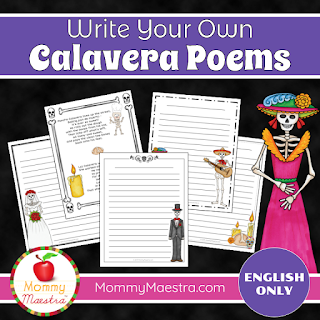 She reached out to me the other day and generously offered to share it with MommyMaestra readers for free! So here you go, my friends. 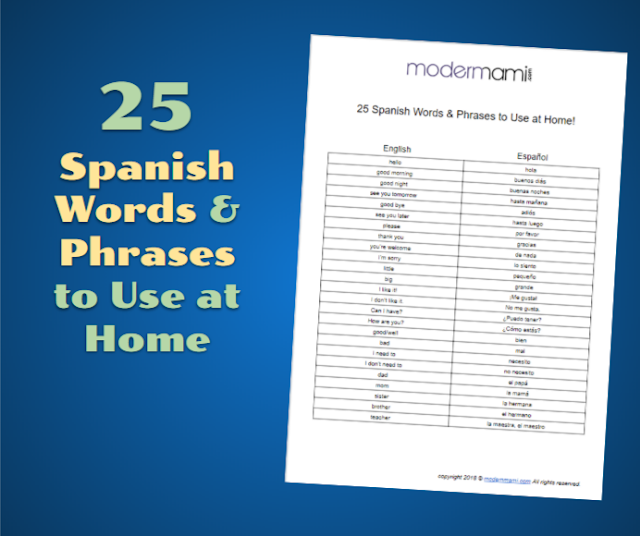 I hope you enjoy this fabulous list of 25 Spanish words and phrases to use at home! And if you have a minute, why don't you stop by her site, ModernMami.com, and take a look around? You will love what you find! Do you know about Lemonhass? 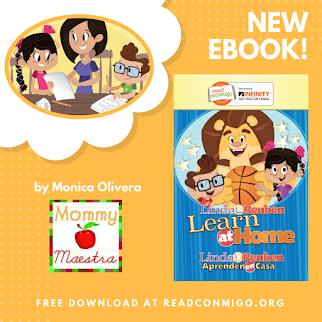 They are an American missionary family living in Mexico and they homeschool their kids in Spanish. 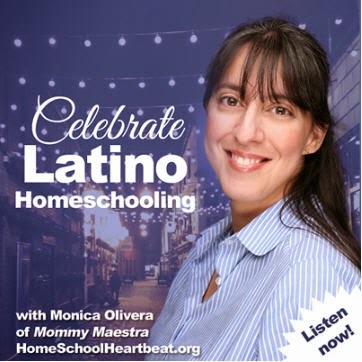 Next week, they'll be hosting a Spanish Online Homeschooling Conference. It's a week-long and features many presenters from Oct. 22-29. If you register, you will have access to all the speakers. It is only $15-$16 with the exchange rate in US dollars or $300 MXP. I'm assuming that once you register, you'll have access to all the videos to watch at your convenience, even if you cannot watch them live. My friend, Mayra Rodriguez, of Estilo Familiar will be one of the presenters. Here's a quick video in Spanish in which she tells you a little more about the online conference. 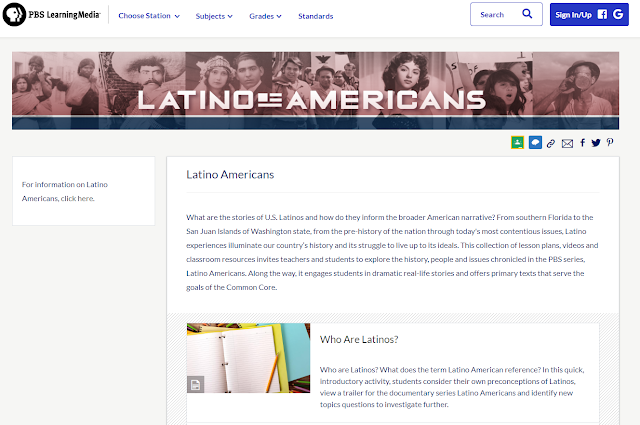 In my last post, I shared with you the wonderful resources from PBS Learning Media centered around their remarkable documentary series: Latino Americans. But did you know that Ray Suarez wrote a book to accompany the series? 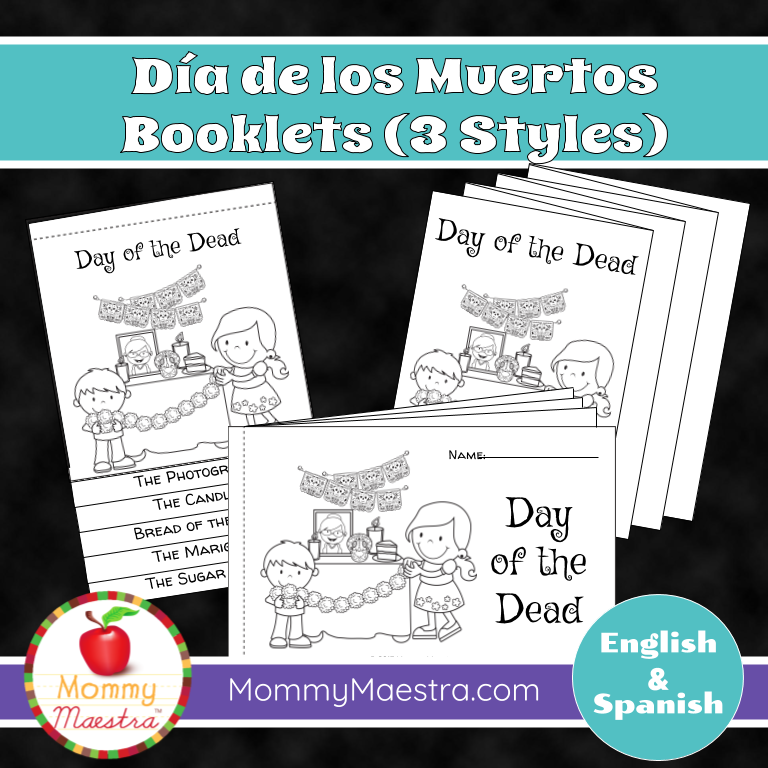 I happen to have a few copies of both the English and Spanish versions in my shop. 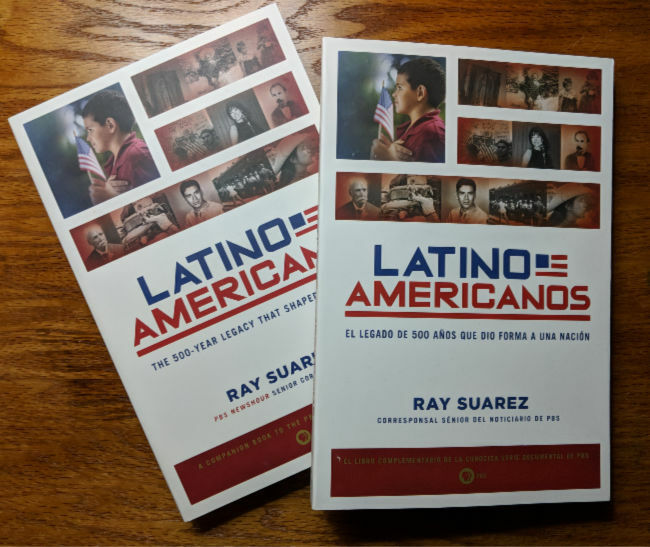 If you are thinking about incorporating a Hispanic Studies course into your classroom or homeschool, I would highly recommend using this book as the spine and using the PBS Learning Media materials and PBS.org to supplement the reading. PBS.org has dedicated an entire section on its website where you can watch episodes of the three-part, six-hour documentary series, and find additional materials related to the show. What's even better is that it is available in English AND Spanish. You can even become a part of the LATINO AMERICANS project with "Mi Historia" and make a video describing what being Latino means to you. 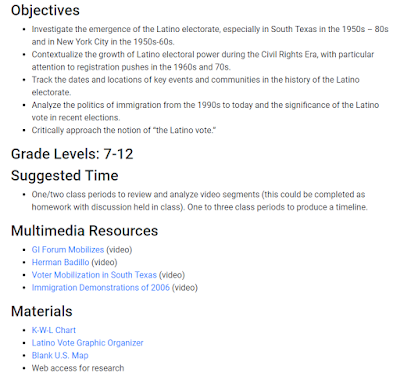 Between these three resources - the books shown above, PBS Learning Media, and the Latino Americans website - you would have a meaty core for your Hispanic Studies course. 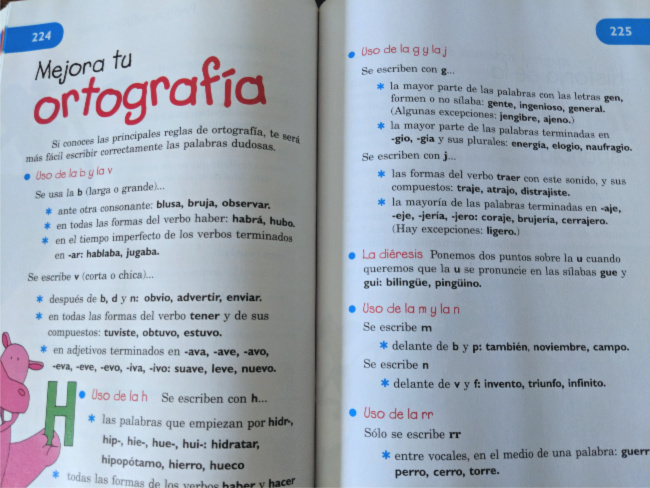 Those of you who are homeschooling highschoolers and who are looking for materials in English or Spanish, this is a definite gem! So slip on over to my shop and get copies of these books while they last. I have them new in my shop for $15, but you can also find them used on Amazon here and here (aff links). I share a lot of resources on MommyMaestra for elementary students, but this week I'm going to focus on older children. 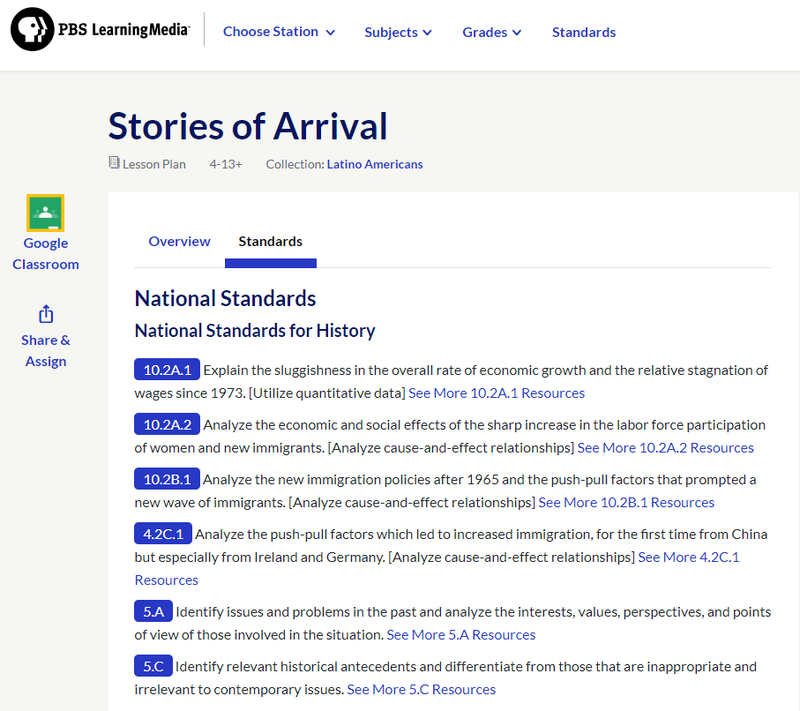 And I'm starting off with one of the online education portals that you may already be familiar with: PBS Learning Media. And there are quite a few biographies, too. These are quality materials that should not be overlooked by teachers and parents. If you are teaching a multicultural studies class to your children or students, this is a must-have. Those of you who must contend with Common Core and state standards, each lesson plan also has a list of the standards that are met. TEACHER BONUS: All of these lessons are Google Classroom friendly and may be assigned directly from the lesson plans. 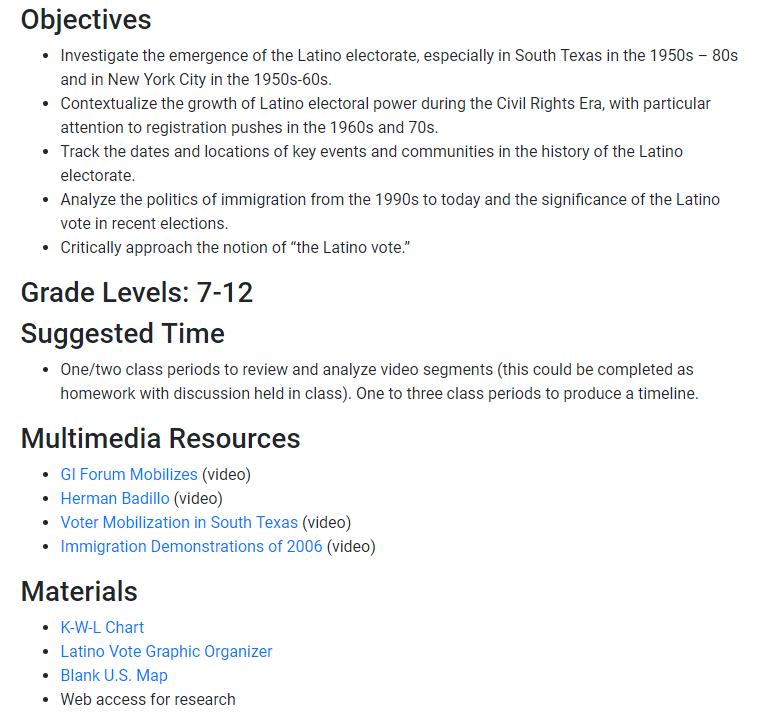 To take a look at all of the lesson plans they have available on this subject, click here. Halloween is just a few weeks away! 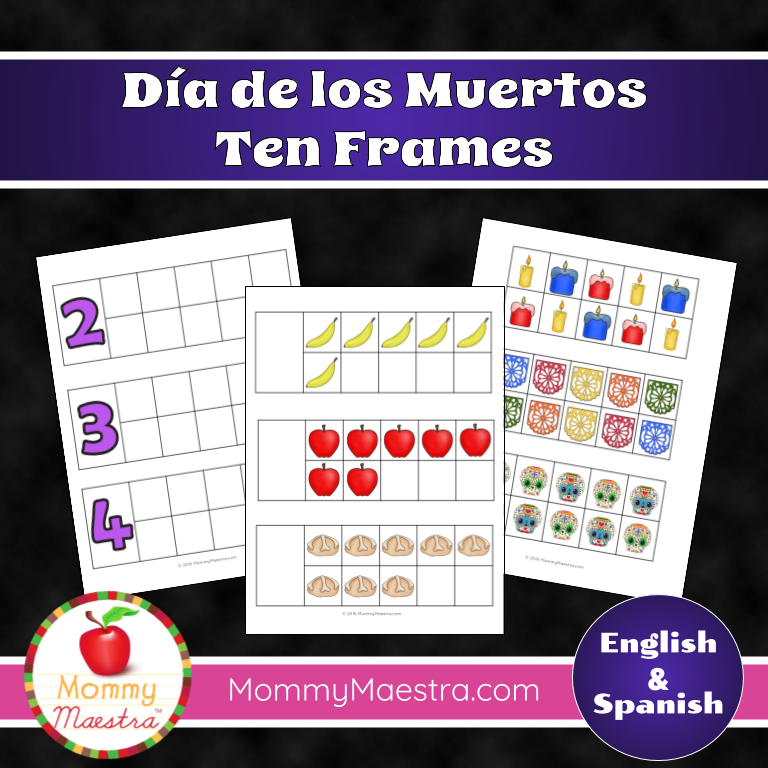 And to helps us celebrate, MommyMaestra sponsor Spanish for You! has made that the theme for this month's Spanish freebie! 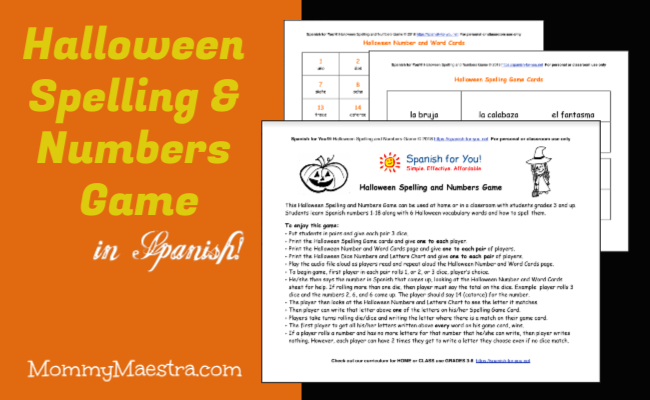 Today's download is a 4-page spelling and numbers game to help Spanish learners learn phrases associated with the spooky holiday, Halloween! The file comes with an introductory page with instructions on how to play the game. There are also number and word cards, a set of spelling game cards, and a page dedicated to Halloween dice numbers and a letter chart. As always, there is also an audio file to help your young student learn the proper pronunciation. Several of you have asked what this story is about. So I dug through my files and found the following review. This is a reprint of the review I did eight years ago of Rosita y Conchita on the Latin Baby Book Club. 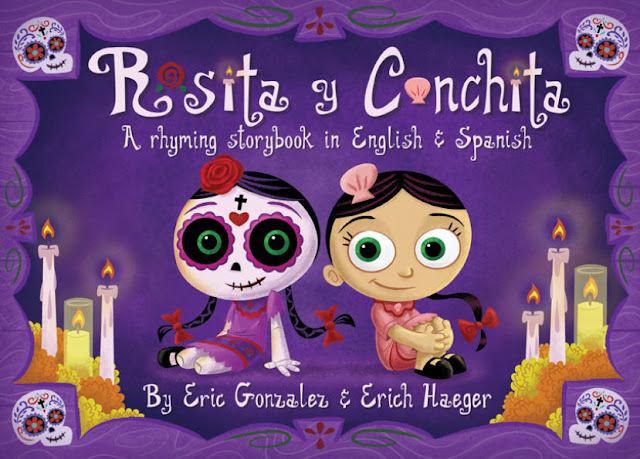 The LBBC’s recommendation for November’s Libro del Mes, is Rosita y Conchita by Eric Gonzalez and Erich Haeger. A few weeks ago when I first read about Rosita y Conchita, I was pretty excited, because I could tell from the cover that a lot of work had gone into this book. 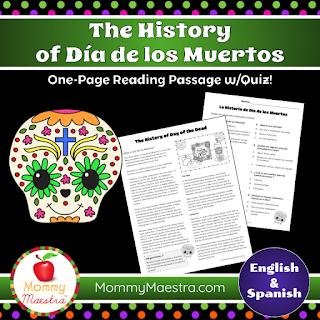 I was hopeful to see a full story developed around Día de los Muertos, since this holiday is really starting to spread like wildfire across the U.S. I was not disappointed. When Eric sent me a copy of the book to review, I was so thrilled to find a story that richly conveys the intention behind the holiday. The story follows twin sisters who are trying to find a way to get together once again. 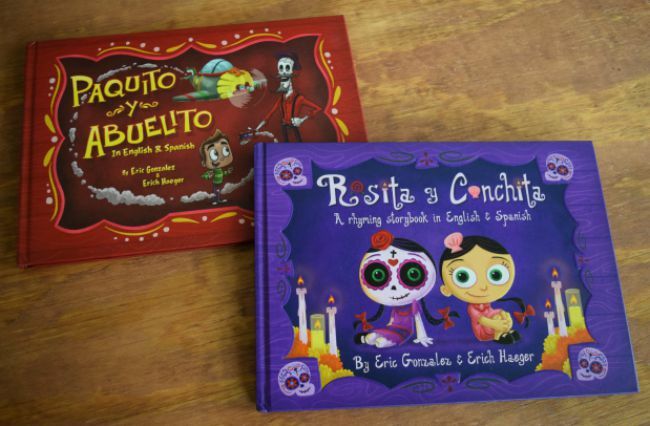 The book describes how Conchita is carefully creating an altar to remember her dearly departed twin, Rosita. The other part tells Rosita’s story as she wanders through the otherworld looking for clues that will lead her to her sister one more time. This lovely little book is not sad or scary. Instead, it treats death in the same manner that the holiday itself does – with humor and love – so that children will enjoy the storyline. 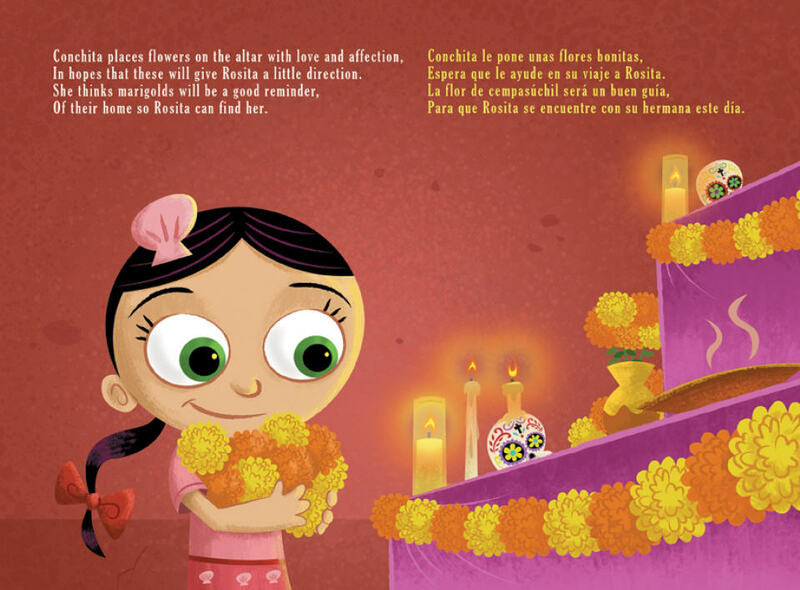 The best part of the book, I thought, was how the authors describe the ofrendas in such a way so that the children reading the book can understand the meaning behind each one. The text itself is another example of the thought and work that both authors invested. 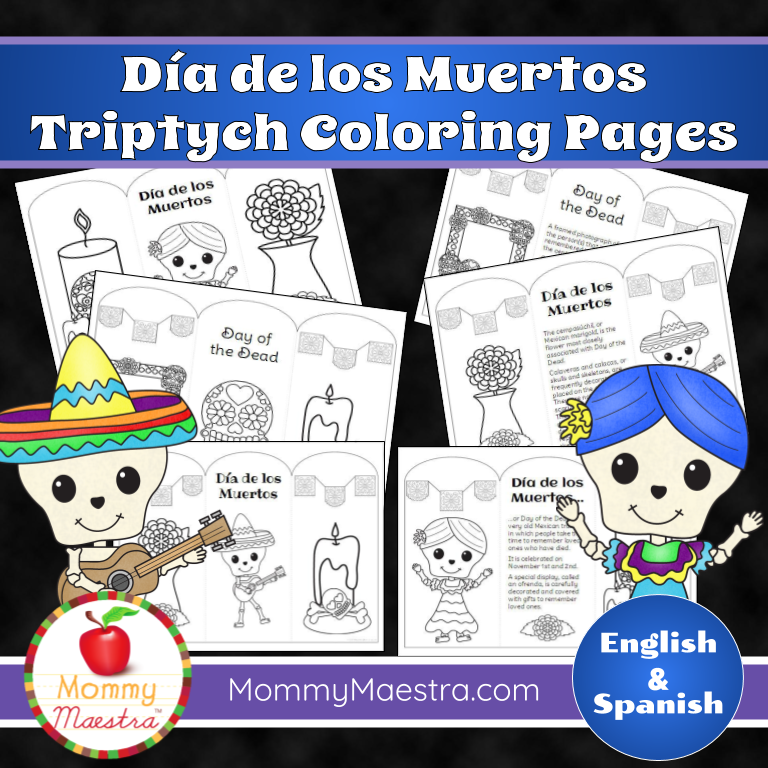 The entire story is written in rhyming verse - in both English and Spanish! I do think that this book should win some sort of award for the subject matter, work it displays, as well as the engaging manner in which it captures the attention of young readers. I also loved how at the end of the book, Eric and Erich have included a history of the holiday (in English and Spanish), a simple recipe for making sugar skulls, as well as directions on how to draw Rosita. While reading this book, my kids had LOTS of questions. And what was really neat was how my older daughter would explain parts of the book to my son, because she quickly understood the messages that were being delivered. Books like these are, in my opinion, really important for our children, because in American culture, death is not often talked about. Many parents don’t want to burden their children with the concept. Maybe because they themselves don't know how to deal with it. Or maybe because they just don't know how to discuss it on a child's level. But I think if approached with love and respect, children can learn that death is not something to be feared, but rather a simple process that is a part of life – not just one that ends it. And I think that the act of creating a “Remembrance Table” actually helps children and adults both, to move through the grieving process and to heal. It is such a special gift to be able to move past the sadness and instead celebrate the lives of our loved ones, giving thanks for their place in our own lives. To be able to remember with joy and laughter, those whom we have loved, enriches our own experiences and makes us healthier emotionally. I think parents and teachers will really LOVE reading this book along with any lessons or activities for Day of the Dead. This book would also be a wonderful supplement to the following topics/themes: poetry, death and grieving, family, indigenous cultures, family relationships, cultures and traditions, and symbolism. It is a great read for children ages 4 and up. 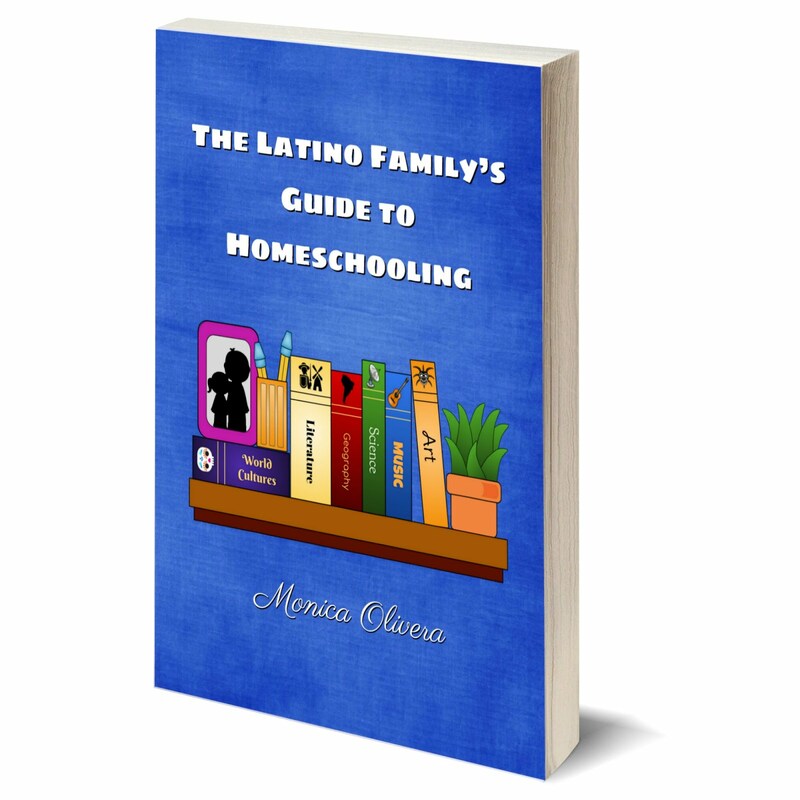 To order this book or learn about the second book in the series, visit our sister site: MommyMaestra's shop. I'm pretty excited about my weekend discovery during one of my regular trips to my favorite used bookstore. When my older kids were little, we used the Write Away series and it was awesome. 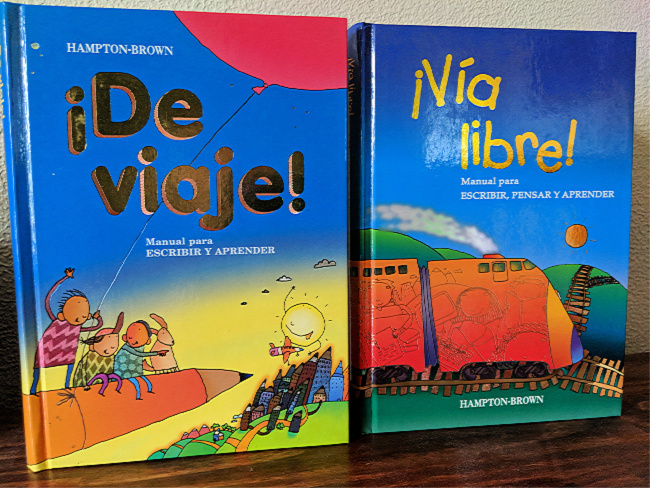 So imagine my delight when I found the SPANISH VERSIONS of both the second-grade and third-grade handbooks! ¡De viaje! and ¡Vía libre! (aff links) are handbooks for young aspiring writers. They guide students through the writing process by using easy to understand directions and giving clear examples. Your child will learn the basics of writing with this book through a variety of writing topics. For example, in ¡De viaje! your 2nd grader will begin by learning ideas on what to write, keeping an idea journal, making a plan or outline and why an eraser is your friend (😉). They'll learn about making revisions, meeting with other writers to get feedback, how to correct their own work, and how to publish what they've written. There's also a section on the nuts and bolts, which covers sentences and paragraphs. Then there is a series of writing activities: personal writings (diaries, funny notes, cards to friends, and personal narrations), themed writings (book reviews, news articles, instruction guides, etc. ), investigational writings (illustrated dictionaries, reports, etc. ), stories, and poems. These writing activities are followed by a section on learning to learn. It covers how to improve your reading, letters and words, how to talk and listen better, and a chapter dedicated to learning skills. Oh, but we're not done! Then there's a grammar section to help students learn about parts of speech, sentences, the mechanics of language, how to improve your spelling, using the correct word, punctuation. The final section is a student almanac with lists and tables of all sorts of things (sign language, the Braille alphabet, Roman numerals, etc. ), maps, math, penmanship, and a look at history. There is a TON of information packed into this little book! And ¡Vía libre! 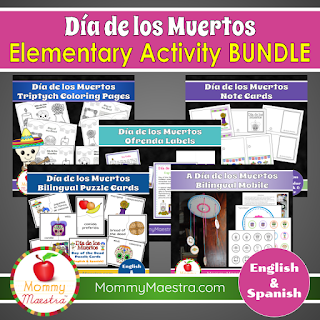 is similar with a little more advanced content geared toward students in 3rd and 4th grades. 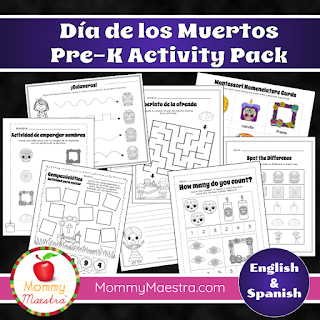 But it has the same engaging style and is also jam-packed full of resources for your young students. Anyway, I bought all three copies of each book and have them for sale in my shop. I wish I could have bought more, but these were the only ones they had. So it's first come, first served. You can find them here. I've sold out, but you can find them here and here on Amazon (aff)!